In a storybook ending to his fall season, sophomore Boris Sorkin captured the Intercollegiate Tennis Association (ITA) Cup Div. III singles national championship on Saturday at the Rome Tennis Center in Rome, Ga., the first Jumbo to do so. No. 4 seed Sorkin broke past No. 2 seed senior Chad LeDuff of UC Santa Cruz in a tight three-set battle, 2–6, 6–4, 6–2. Though the rest of the players did not find the same success that Sorkin did, the team is proud of a fall season full of hard work and improvement. After losing the first set, Sorkin adjusted his mentality to secure the title. Sorkin also noted that he decided to stick to the strategy he established from the start of the match. Prior to the finals, Sorkin rallied back from a one-set deficit to upset top-seeded senior Jonathan Jemison of Emory, 5–7, 7–5, 6–3. He defeated third-seeded senior Chaz Downing of Carnegie Mellon in straight sets, 6–4, 6–1, in the best-of-three match quarterfinals. A native of St. Petersburg, Russia, Sorkin is the first Jumbo to win the ITA Cup in program history. The championship marks the third and most prestigious title he has taken home this season. Earlier in the fall, the sophomore sensation beat first-year Pieter Wernink of Bates 6–0, 6–2 to seize the Middlebury Invitational A Flight singles title on Sept. 16. Sorkin also emerged victorious from a back-and-forth battle with senior co-captain Jerry Jiang of Bowdoin to take the ITA New England singles crown on Sept. 30, 6–4, 3–6, 6–3, which earned the Jumbo a berth in the ITA Cup. Sorkin stayed humble and stressed that the Jumbos’ results as a team during their spring season — rather than individual tournaments in the fall — are what really matter. While Sorkin competed in Georgia, the rest of the team played in their last tournament of the fall season at the Tufts-Brandeis Invitational. In the A singles flight, Tufts junior Ben Biswas defeated sophomore Rajan Vohra of Brandeis 6–7 (3), 6–2, 10–8 before falling in the Round of 16 to the eventual champion and No. 3 seed senior co-captain Noah Farrell from Middlebury. After losing the first set, Biswas wrested back the second set in a tiebreaker but ultimately lost in a nail-biting contest, 6–4, 6–7(3), 12–10. Two more Jumbos found success in their opening matches within the B singles flight: sophomore Owen Bartok blitzed through first-year Michael Medvedev of Williams, 6–2, 6–2, while junior co-captain Ethan Bershtein lost just two games in beating sophomore Pablo Ampudia of MIT, 6–2, 6–0. Later, Bartok was defeated by fourth-seeded sophomore Larry Zhao of Bowdoin 6–2, 6–4 in the Round of 16, and Bershtein lost to second-seeded first-year Harris Foulkes of Amherst in a close three-set match, 6–2, 5–7, 10–6 in the same round. Many Jumbos fell in the opening round in hard-fought matches. In the A doubles flight, the sophomore duo of Carl-Herman Grant and Niko Herford lost to junior Justin Patel and first-year Oscar Yang of Bowdoin, 8–6. Bershtein and fellow junior Nathan Niemiec also fell in their first-round doubles match-up to the MIT duo of senior Tyler Barr and junior Victor Cheng, 8–4. In the B doubles flight, the first-year team of Dylan Glickman and Jack Moldenhauer lost their match to Amherst senior Jesse Levitin and first-year Damien Ruparel 8–6, and the pair of senior co-captain Ross Kamin and first-year Lantis Wang also fell to sophomore Tristan Young and senior Aidan McGrory by the same scoreline. 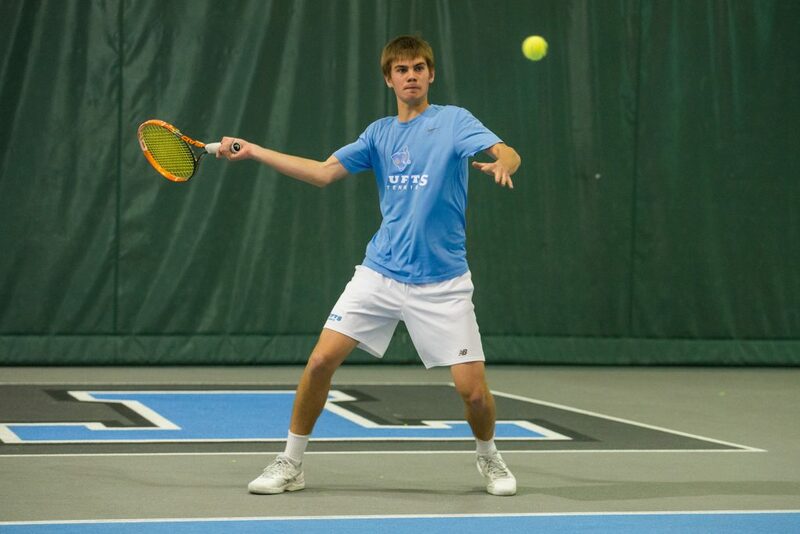 Though the team hopes to improve their doubles game to contend with some of the nation’s best in the in the spring, Kamin was overall very pleased with the team’s performances over the fall season. Kamin also emphasized that maintaining focus and intensity over the offseason during the winter will be crucial to the team’s success next year. The Jumbos will be back on the court to kick off their spring season on March 9 against the Brandeis Judges.